Antoine Fafard first came to prominence as the leader and bass player for the outfit Spaced Out. Since launching his solo career he has continued the jazz rock traditions they envisioned. His last album ran closer to the pure jazz fusion side of the equation. To me, this one gets more into progressive rock territory. Since Fafard plays bass, one might guess that the instrument would dominate. That’s not really the case. Sure, the bass playing is amazing, but the song always comes first. This is a powerful album, however you slice it. I’d say that I like this one more than I did the last, and that one was quite strong. 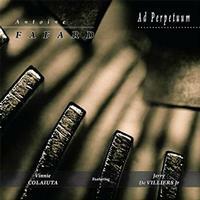 The main musicians on all the tracks are Fafard along with Jerry De Villiers, Jr and Vinnie Colaiuta. Gerry Etkins plays on three tracks. Gary Husband guests on one piece. Jean-Pierre Zanella is on three compositions. Percussion leads things off here. After that we’re taken into some cool melodic fusion. A mellower drop back mid-track includes some killer bass work. The bass is purely on fire as this one starts. It’s another high energy fusion piece. The guitar soloing on this is pretty amazing, too. Everyone involved here gets a chance to shine, though. In some ways this starts off more pure progressive rock. It shifts pretty quickly to more fusion based stuff, though. There is a lot of rock, but mellow rock, in the mix on this. The bass playing on this is possibly the best of the whole disc. Given the quality of all of it, that says a lot. Combine something like Joe Satriani with fusion. I suppose one might hear some Al Di Meola on this, too. It’s another killer melodic instrumental tune with great soloing. This is a killer jazz jam. It is really very much like a lot of the fusion that came out in the 1970s. It has some of the coolest horn work of the whole disc. In a lot of ways this makes me think of something Di Meola might do. Everyone is on fire here, and it’s scorching fusion. Progressive rock and jazz merge quite well on this piece. It’s mid-tempo and very melodic. It’s got a lot of drama and charm. Somehow this has real modern rock heaviness as it opens. It’s another that’s a great merging of prog and jazz. I love the really deep sounds that open this. That gives way to another tasty and tasteful jazz treatment. The horn soloing on this is excmplary.